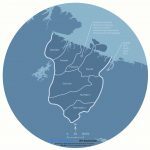 The Saaʹmijânnam – The Skolt Sámi Land project aims to bring to light information about the history and culture of the Skolt Sámi people and the way the circumstances of their land have changed over time. The Skolt Sámi Land is the home area for the indigenous Skolt Sámi people. 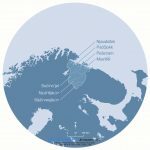 It is located in an area which today is divided between Norway, Finland and Russia. The Skolt Sámi are an indigenous people with a unique culture and history. Starting in 1826, various state borders were drawn through the Skolt Sámi homeland. Today, at least a thousand people can claim Skolt Sámi ancestry. 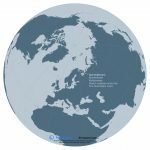 Most of them are citizens of Norway, Finland and Russia. The Äʹvv Skolt Sámi museum in Neiden, Norway, since 2017 holds an exhibition about the Skolt Sámi people and their land. The exhibition is called Saaʹmijânnam – The Skolt Sámi Land. Saaʹmijânnam means ”Skolt Sámi Land” in the Skolt Sámi language. 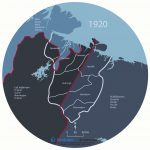 For the exhibition, a series of maps were made as a collaboration between the Äʹvv Skolt Sámi museum (responsible for the reconstruction of the Skolt Sámi areas, as well as the exhibition), Nordregio (which produced the base maps) and the design agency Rethink. (which made the graphic design of the maps). Apart from being shown in the exhibition at Ä’vv, the maps are also available in Nordregio’s map gallery. The nine maps are divided into three themes. The three Community maps show the location and sub-divisions of the Skolt Sámi Land, and its’ relation to the surrounding mountains, rivers and lakes. The three History maps show selected historical aspects of the Skolt Sámi Land, in relation to the surrounding peoples and powers. Finally, the three Border maps show the developments during the last 200 years, when the the Skolt Sámi Land several times was divided by the distinct borders of nation states, leaving little space for the Sámi. Follow the links below to access each map. 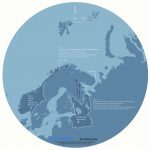 The exhibition architect Yngvar Julin and museum manager Honna Havas at Ä´vv developed the concept of the maps, with the main idea of centering the Skolt Sami Land in each map. Honna Havas also reconstructed the Skolt Sámi areas and provided culture historical research to base the maps upon. 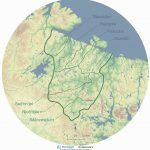 This includes the boundaries of the Skolt Sámi Land as well as the extent of the sijdd’s (which is a geographic area, but also relates to the people who use the sijdd), and reconstruction of water bodies before they were dammed during the 20th century. Based on this material, Senior Cartographer/GIS analyst Linus Rispling at Nordregio collected geographic data and produced base maps for the exhibition. 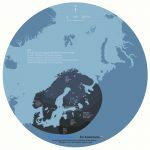 The graphic design of the maps was then finalised by graphic designer Martin Skulstad at Rethink., in collaboration with illustrator Ruth Thomlevold.